The sun is incredibly important to us, and natural light serves many, many purposes, not least giving us warmth and letting us know the day has begun. It isn’t just sunlight that acts as in important light to us. When early man discovered fire, it was revolutionary. To cook with and to provide warmth, but in the evenings, to illuminate the area with soft gentle flickering and to ward off wild animals and danger, keeping the camp safe. The fact is, we evolved to need light and in the modern world, light makes many of our most up to date conveniences possible; take the blue light from phones or laptops for example. Light creates atmosphere, it influences our emotions, it turns a mere aesthetic into a complete experience. Light is exceptionally important and so, it makes sense that the way you use light in your home sits at a high priority when it comes to making it a wonderful place to spend time in. Different spaces will demand different lighting, and more often than not, different types of lighting at different times. The bathroom, for example, will need a bright light for brushing your teeth and hygiene, lowlights for relaxation time, possibly special mirror lighting for makeup application, and then floor lighting for safe bathroom visits in the night. A kitchen may have bright practical lighting, display cabinet lighting, under cupboard low lighting, dimmer switches and different lighting for different ‘zones’. The functionality of each space will have a huge impact on the kind of light you use. Establishing how you want to use that space before you plan your lighting will help you to get the most out of that space when it comes to the light ambience. If you want help creating a lighting plan, take a look at this handy guide to creating a lighting plan from BBC Homes Design. Shade can be just as important as light. Consider a starry sky, it becomes more illuminated the less light pollution there is. 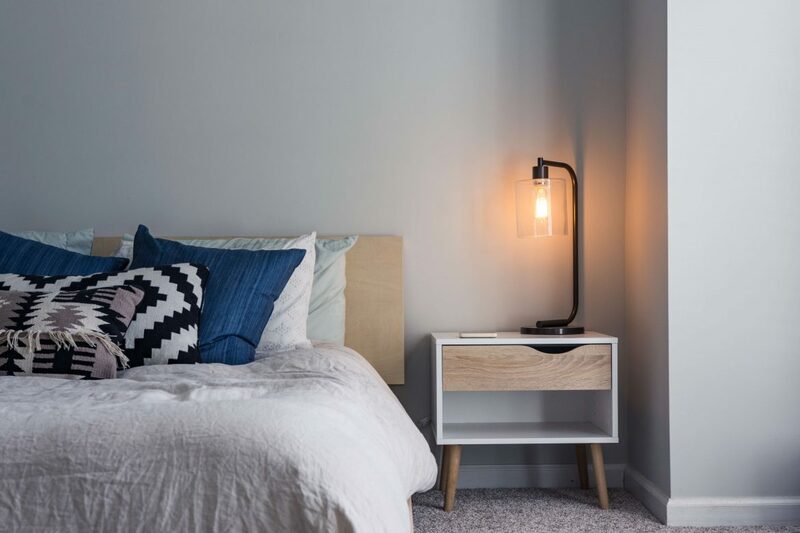 Try to create a contrast between the lit areas by using floor lamps, candles and other ambient lighting that doesn’t try to ‘fill all of the gaps’ instead it allows gentle shadows to be created, forming a pleasing visual texture and atmosphere in the room. 1 in 15 people have SAD in the winter months and, it can affect some people to the point they feel very depressed and struggle with day to day life. There are lots of ways to minimise the effects of Seasonal Affective Disorder including opening your curtains and blinds and getting as much natural light as possible. One of the most effective ways is to deal with SAD is to invest in a SAD lamp which is a special lamp that shines a bright light designed to improve your mood, replicating natural light. You can find a really great guide to buying a SAD lamp from WHICH here. Natural light is something we can take for granted in the home because it is always there for more than six hours every day. However, we can make more of it for a lighter, brighter home. The Scandinavian approach to life, Hygge, has a huge emphasis on making the most of natural light because it is deeply important to us as humans. It may be that you’ve fallen out of love with natural light in your home because it is either bright and harsh or not, with no in-between. Why not use beautiful window adornments like plantation shutters to control the ambience of the natural light that comes into your home? Always assume that the lighting you know, is not all there is. We can become very small-minded in what we think is available, forgetting the endless innovation around now, and that will continue to grow in the future. Visit decor centres and shops to see the latest designs in lighting. This kind of shopping trip works well if you’ve recently banished bad lighting and want a beautiful replacement. Once you see the potential in your home when it comes to lighting it, you will discover an entirely new area of decor to explore. There really are no limits to the creativity you can apply using light, and the power of good lighting in a home can be truly transformative. Why not try transforming your home with a new lighting plan, it could unleash the potential in your home in a way you didn’t realise was possible.